Beefsteak tomatoes, aptly named large, thickly fleshed fruits, are one of the favorite tomato varieties for the home garden. Growing beefsteak tomatoes requires a heavy cage or stakes to support the often 1-pound fruits. Beefsteak tomato varieties are late maturing and should be started indoors to extend the growing period. The beefsteak tomato plant produces classic slicing tomatoes that your family will love. Beefsteak tomatoes have meaty flesh and numerous seeds. There are many varieties available with different sized fruit, harvest times and growing ranges. Some of the varieties are more suited to humid climates such as Mortgage Lifter and Grosse Lisse. The huge nearly 2 pound Tidwell German and Pink Ponderosa are both old time favorites. For super productive plants, chose Marizol Red, Olena Ukranian and Royal Hillbilly. There are many heirloom varieties of beefsteak. Tappy’s Finest, Richardson, Soldaki and Stump of the World are just a few of the saved seeds of once common tomatoes. If you are growing beefsteak tomatoes to amaze friends and family, choose Mr. Underwood’s Pink German Giant or Neves Azorean Red. These plants frequently produce 3 pound fruits of excellent flavor and juiciness. Most of the beefsteak tomato varieties require a growing season of at least 85 days to harvest. This is not possible in most of the United States, which means starts or your own transplants are the best way to begin. If you are a stickler for consistency, you’ll want to start your own seed. March is an ideal time for planting beefsteak tomatoes indoors. Sow seed in flats and nurture them until they are at least 8 inches tall and exterior soil temperatures are at least 60 F. (16 C.). The beefsteak tomato plant needs to be hardened off before planting outdoors, usually around May. 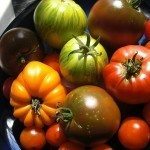 Choose a sunny, well drained garden bed in which to plant your tomato starts. A raised bed warms early in the season and is a good method for how to grow beefsteak tomatoes in cooler climates. Work in compost or other organic amendments to the soil before you plant and incorporate a starter fertilizer to get the little plants off to a good start. Allow spacing of at least 5 feet for good air circulation and install sturdy cages or other support structures. Beefsteak tomato varieties will need tying in, as they are trained up a support. Beefsteak tomatoes are primarily indeterminate, which means you may remove the auxiliary shoots to promote better branching. Keep weeds removed from the bed and mulch between the rows to minimize weeds and conserve moisture. A black plastic mulch also warms the soil and radiates heat. Fertilize every three weeks with 1 pound per 100 square feet. The optimum ratio for tomatoes is 8-32-16 or 6-24-24. The beefsteak tomato plant will need 1 to 2 inches of water per week. All beefsteak tomato varieties are prone to disease and pests. Keep a close watch and nip problems in the bud as soon as you see them.